Stephen Strasburg will start Game 1 of Washington's NL Division Series against the Chicago Cubs, Nationals manager Dusty Baker announced Thursday, and two-time Cy Young Award winner Max Scherzer might not pitch before Game 3. Scherzer tweaked his right hamstring during his last regular-season start and bypassed planned bullpen sessions during workouts at Nationals Park on Wednesday and Thursday. Lefty Gio Gonzalez did throw off a bullpen mound Thursday, making it seem likely he would start Game 2 on Saturday. The series opens Friday night at Washington. General manager Mike Rizzo said the team would not decide on a Game 2 starter until later Thursday. Baker said either Scherzer or Gonzalez would get Game 2, and the other Game 3. "A lot of it depends on our evaluation of Scherzer," Baker said. For the second day in a row, Scherzer threw on flat ground in the outfield but did not go through a bullpen session off a mound, which starters usually do two or three days before a game. Baker had said Tuesday that the plan was for Scherzer to test his leg in the bullpen Wednesday; on Thursday, Baker again said Scherzer would have a bullpen session. "When you have a nagging injury, every day is important for our trainers to evaluate it, put hands on him, and see if he's still sore or if he's feeling great,'' Baker said. Because of days off in the schedule, whoever pitches in Game 2 could be available on regular rest to start Game 5, if there is one. The Cubs already announced their pitching plans, saying Wednesday that their rotation would be Kyle Hendricks in Game 1, Jon Lester in Game 2, Jose Quintana in Game 3 and Jake Arrieta in Game 4, if there is one in the best-of-five series. Scherzer is a two-time Cy Young winner, including taking the 2013 AL honor while with the Detroit Tigers. This season, he topped the NL in strikeouts with 268 and finished second with a 2.51 ERA, while leading the Nationals in wins at 16-6. Strasburg, meanwhile, has been just about as dominant in 2017, going 15-4 with a 2.52 ERA and 204 strikeouts - and particularly terrific down the stretch, with a 5-1 record and 0.84 ERA in his last eight starts. "This is what we brought him here for - to be a No. 1 starter in the playoffs. He's been our horse," Rizzo said. "He has the repertoire, character and makeup to be a No. 1 starter." 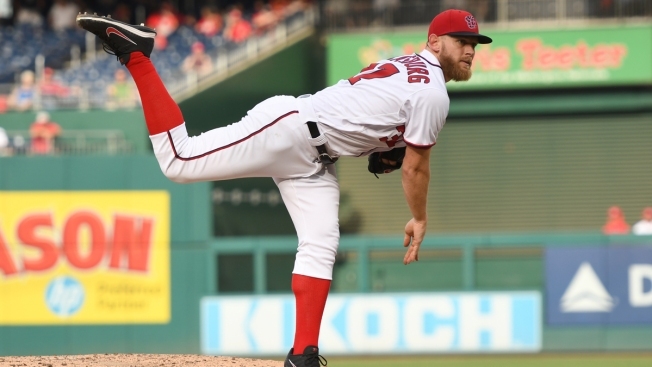 Game 1 will be just the second career postseason appearance for Strasburg, the No. 1 overall pick in baseball's 2009 amateur draft. The right-hander went five innings in a 2014 game against the San Francisco Giants, but otherwise was shut down for the 2012 playoffs a year after having Tommy John surgery, then was sidelined by an arm injury at the end of last season. "I'm excited for the opportunity to pitch in the playoffs again. It's one thing you really can't take for granted," Strasburg said, "and you've got to make the most of every opportunity you get." Baker didn't exactly describe the 6-foot-4 Strasburg as sounding all that excited when told about Friday's start. "He doesn't really show disappointment or happiness, either way, really," Baker said. "Because I called him in before I got here, and I just said: 'Hey, man, you're starting Game 1. You probably figured that.' He had that same look when he left my office as when he came in."